“The reason that made Switzerland so interesting as the capital of espionage - particularly Geneva - has not changed,” Snowden said in an interview to Darius Rochebin on RTS, a Swiss broadcaster. The two spoke at the International Film Festival and Forum on Human Rights on March 5. The transcript of the interview waspublishedin le Temps, a Swiss French-language newspaper, this Saturday. According to Snowden, other Swiss cities have also been “affected” by US spies. “You have exceptional flows of capital and money in Zurich. You have bilateral agreements and international trade in Bern,” he said. The ex-NSA man recalled the time he was working in Geneva as an undercover US agent. He said the Americans weren’t afraid of Swiss intelligence. He drew examples of CIA operations concerning weapons of mass destruction, adding that people “involved in nuclear proliferation” were violating the law in Switzerland, Germany and neighboring countries. “That's why representatives of the US government, even when they violate the Swiss laws, have a certain level of comfort, knowing that there will be no consequences,” Snowden concluded. Snowden is wanted by the US on charges of espionage and theft of government property after leaking a vast trove of classified material to journalists. The whistleblower’s revelations lifted the lid of secrecy on a vast range of the National Security Agency’s global spying operations. The ex-NSA agent arrived in Moscow on June 24, 2013, on a flight from Hong Kong. He had intended to board a connection to Cuba. However, his passport was revoked by the US, leaving him stranded in Moscow’s Sheremetyevo Airport. He was granted asylum for one year in Russia in August 2013. A year later, he received a Russian residence permit, which is valid for three years. This period started on August 1, 2014. 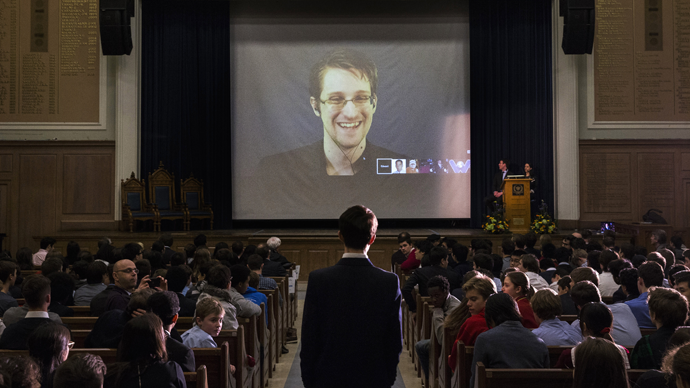 Snowden has been the recipient of the German 'Whistleblower Prize,' the Sam Adams Award, presented to him in Moscow, the German ‘positive’ Big Brother Award, the Ridenhour Truth-Telling Prize, and the Fritz Bauer Prize. He also joined the board of directors of the Freedom of the Press Foundation, co-founded by Daniel Ellsberg, and was elected in absentia as rector of the University of Glasgow.